Watt's Up? : What is a floating power supply output? What is the purpose of floating the power supplies terminals? Power supplies with floating output terminals are more versatile, so they can be used in more applications. Since neither output terminal is internally connected to earth ground, either terminal can be connected to earth ground externally. Some devices that are tested by powering them with a power supply already have a connection to earth ground and it could be the positive or negative input on the device. 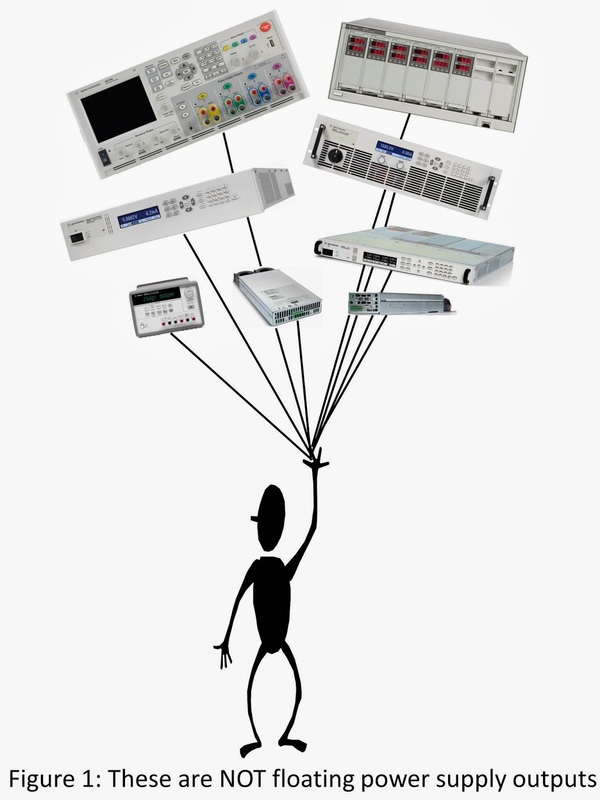 Our power supplies can accommodate all of these types of devices because the power supply output are floating. More information about this is in the post in the paragraph directly under Figure 3. Why is a floating DC terminal which is at 240V above ground not dangerous ? If I am at ground potential and touch that terminal (although the DC differential voltage is only lets say 24V), am I not at risk of getting a shock too? Why do you state there is no power behind it. If my DC output has a 10A output rating, isn't that dangerous as well? Floating the output to 240 V DC certainly causes a shock hazard! Anytime someone is near a voltage that is maintained at or above around 50 V DC, they have to be very careful and not touch it. 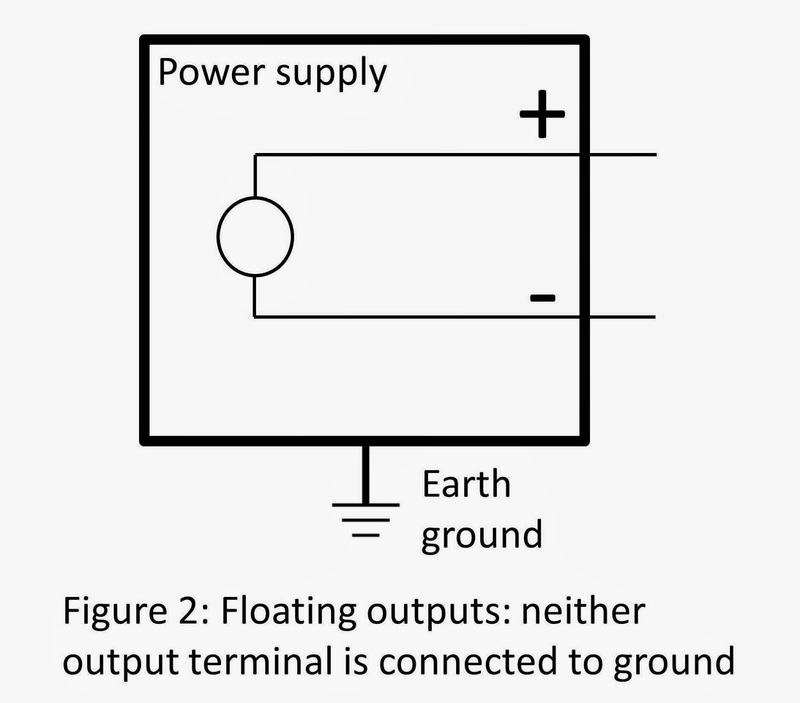 So if an output voltage of a power supply (output terminal to output terminal) is above around 50 V DC, or if you purposely float off earth ground a lower output voltage to more than around 50 V DC off earth ground, you must be very careful. My point about there being no power behind a voltage was under different circumstances. If you are using a power supply without connecting another source from earth ground to one of the output terminals (the output is floating from earth ground), there could be some stray current paths that could produce a voltage from one of the output terminals to earth ground. But the impedance in series with this current path will typically be very high. For example, if the stray impedance path is 10 M ohms, and the stray voltage floats to 240 V DC, there is only 24 uA of current capability if you touch it (or even short it and our bodies have resistance much higher than a short). You can't even feel 24 uA of current flowing through your body (but it will flow). About 1 mA is the threshold of sensation and problems start around 5 mA. Current flow through the human body is what is hazardous. Voltage causes current flow and will be hazardous only if the voltage is high enough and the source impedance is low enough (and your body resistance is low enough). Voltage produced across the output terminals of a power supply has near zero source impedance and is therefore hazardous above around 50 V DC. When someone connects a second supply to a power supply output to float the output above earth ground, again, the series combination has near zero source impedance and is therefore hazardous above around 50 V DC. But if a stray current causes a voltage to build up between a power supply output terminal and earth ground with no source connected to earth ground, the source impedance will typically be high enough so that there is no shock hazard even if that voltage exceeds 50 V DC because the current that can flow is too low. You can test a stray voltage to see if it “has power behind it” by putting a few hundred K ohms across it – if the voltage is maintained, it can produce current that could be hazardous. If the voltage disappears, it is most likely a stray voltage that is not hazardous. IF YOU ARE UNSURE ABOUT THE SOURCE OF A VOLTAGE, TO BE SAFE UNDER ALL CIRCUMSTANCES, DON’T TOUCH ANY VOLTAGE ABOVE 50 V DC! 1- measure positive to ground i have +12 vdv and to negative -12 vdv ( this is floating Voltage? this system is connected to the same ground PE, does any noice or can damage same component? I am using 24Vdc sensor and want to ground this sensor to 24Vac DDC controller. How to do this? The situation is this: There is a stretch of high tension power lines transmitting 3 phase power from one transformer to the next, with no ground. (delta to delta) The stretch therefore has total Galvanic isolation from ground. I think if one of the three phase wires broke and fell to the ground it would arc, or if you touched it you would be fried. I believe there would also be a voltage gradient at and near where the wire touched ground. Is this true? If it is, how is it possible since there is no return path to the isolated delta to delta stretch to complete the circuit? One thing is clear: to be safe, STAY FAR AWAY FROM ANY UTILITY WIRES!! What is your recommendation for minimum clearance (any side of the output to earth ground) if I would like a power supply with 240V floating voltage? Even though the requirement to meet certain safety standards is slightly lower, I recommend 2 mm or more. I have a floating 24v UPS system, which feeds two 24v converters/rectifiers (takes the input and makes sure that it only gives 24v out (24v UPS tends to give out 27v)). These two converters/rectifiers work in parallel and have their own negative connection (its also cross connected (the negative's on both are also commoned (i assume as some sort of redundancy). I recently found that after one of the converters/rectifiers went faulty, it tripped the process/load only when I disconnected the negative. Do you think this is because its a floating power supply (UPS) or the commoned neutral? If its because of the floating power supply is there a way of making it a true 24v system? It is always challenging to describe a schematic in words as you may have found in writing your question. Without a diagram of your setup, I don't understand your scenario well enough to provide a response. In any case, it seems like you would be better served contacting the UPS manufacturer and/or the converter/rectifier manufacturer to diagnose what happened. Hello, i purchased a used mainframe 66000A with some power modules. I like the possibility to have more than one voltages in one device, which is often needed in the laboratory or testing. My question, just to be sure: Can i have a negative voltage also, even my power modules are rated 0 to +8, 0 to +20 or 0 to +35 volts? For example in putting the positive output of one to the negative output of the other module, to make 2 voltages like + and - 12 volts or + and - 15 volts, etc. I think, this is not possible in power supplies with its negative output grounded to earth. Thanks. The 66000A power module outputs are all designed to be floating from earth ground (up to 240 V maximum) as shown in Figure 2 above. So that means you can connect the output terminals as you describe above to produce positive or negative output voltage; you can ground either output terminal of a floating output or connect the negative output of one module to the positive output of another module to produce plus and minus voltages. If you had power supply outputs all with their negative outputs internally connected to earth ground (not floating), this would not be possible. Thanks. This sounds great and i look forward to make my first tests with it. Sometimes my desk is crowded by 3 or 4 power supplies for just a simple tests (for example +5.0V, +3.3V, +23.0V for display backlight, etc.) and still there are cases where i need +12.0V or a negative voltage (amplifiers +/- 15.0V or another for exotic negative displays voltage). When talking about a floating voltage that's sitting, say 200V above ground, you must mean that that floating voltage is connected to a load, and that the load is 200V above earth ground, is that correct? I'm asking because earlier in the post you mention how a floating supply has 0V between either of its leads and earth ground. Also, how would such a voltage be measured if the supply is truly floating? I'm not sure what you mean by "connected to a load". We use the term "load" to mean power drawn from a source. 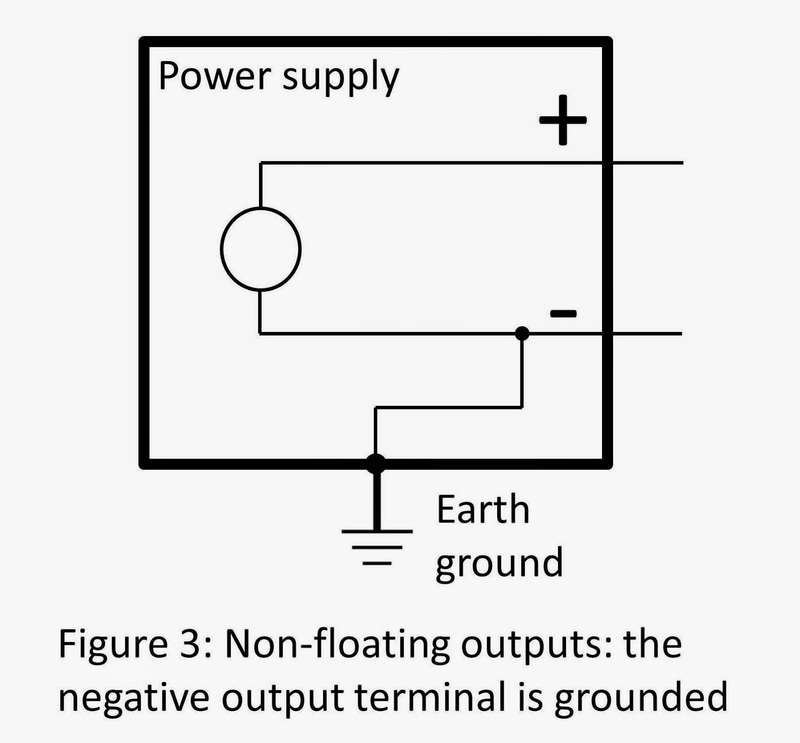 In any case, Figure 4 shows an example of the negative terminal of a floating supply connected to a voltage source that is 200 V above earth ground. 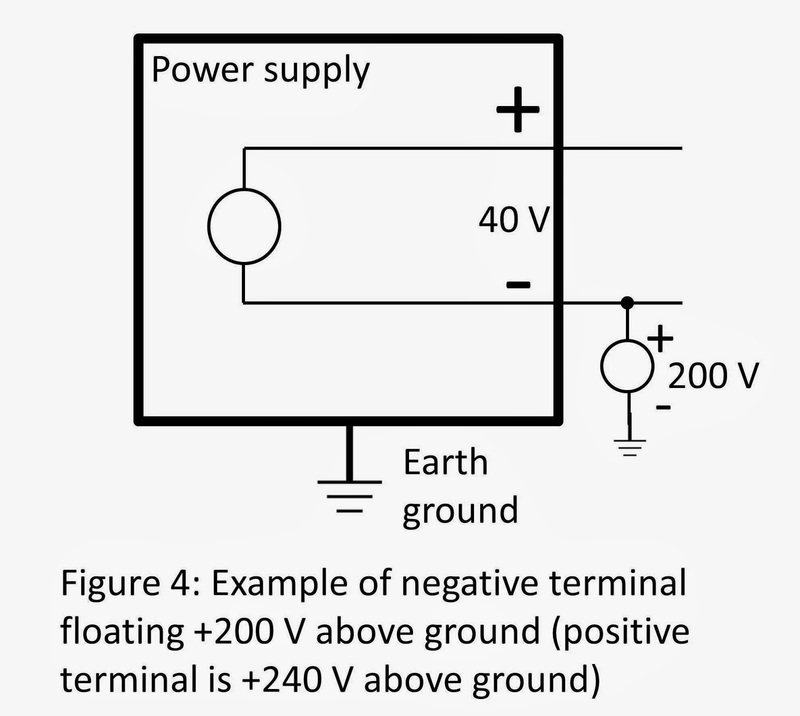 So in this example, the minus side of the 200 V source is connected to earth ground and the positive side is connected to the negative terminal of the floating supply. You can think of these 2 voltage sources as connected in series, each regulating its own output voltage, with earth ground being the lowest potential in the series combination. And if you interpreted my statement, "There is no voltage potential...to earth ground" to mean there is 0 V to earth ground, that is not what I meant. 0 V across any 2 points would mean those points are at the same potential which means you can consider them shorted together. That is the opposite of 2 points that are floating from each other (no common reference). Perhaps I could have made this clearer by saying "there is no defined voltage potential" instead of just "there is no voltage potential". Voltage between 2 points that have no common reference is undefined. In theory, you cannot assign it a number. In practice, you will likely measure something because of leakage paths. To predict what you would measure, you would have to know all of the leakage paths in the surrounding area, which could be impossible. So if the supply is truly floating and you connected a perfect voltmeter (one that does not interfere with what you are trying to measure) from either terminal to earth ground, you could see any measurement because the voltage is undefined. It would be similar to what you would see if you had a perfect voltmeter with open leads. What would the measurement mean? The answer is the measurement is meaningless. Thank you, Gary. That certainly clarified it for me! The reason I said 0V is because like you said "there is no potential between a floating source and earth" but also because I measured between a battery and earth and got 0V on my multimeter, but like you said, the measurement is meaningless. I think the important point is that there won't be any significant current flowing between a floating source and earth, even if it is shorted to earth by a wire or a person's body. Hi, so i am wondering, what determines the voltage level above true ground when using floating power supply? Is the power supply acctually made up of two voltage sources in series as depicted in figure 4? Also, is the upper limmit of "floatation" dictated by the input voltage to the power supply? I'll answer your question assuming you mean "earth ground" when you say "true ground". The voltage level above (or below) earth ground of either the positive or negative output terminal is somewhat undefined. Ideally, if there were no current leakage paths in the world, there would be no voltage between a floating power supply output terminal and earth ground. But there are always some current leakage paths somewhere, even if they are infinitesimally small. For example, current can leak across the surface of a dirty (or even clean) printed circuit board. So any capacitance between a floating power supply output terminal and earth ground could get charged by this low-level leakage current. The leakage current can come from any earth-ground referenced voltage, such as the rectified AC line itself, or through an isolation transformer that is isolating the earth-ground referenced voltages from the isolated DC output side of the power supply. The power supply is not made up of two voltage sources in series as shown in Figure 4. Figure 4 shows 2 independent power sources connected in series with the external-to-the-power-supply 200 V source referenced to earth ground (its negative output terminal is connected to earth ground) and the power supply itself producing the 40 V. The upper limit of the float voltage is determined by components inside the power supply that have voltage ratings that cannot be exceeded without damaging them (as stated in the last sentence of the post). I want to use 110 V Floating DC, which is 320V up from the minus, and 220 AC in same control panel for purpose of power supply redundancy. I am not sure that if this configuration can cause demage during the interchange. Could you please give me requmendation. Check the maximum rated float voltage for the 110 V power supply. If it can accommodate being floated to 320 V, it is OK. If it cannot accommodate a 320 V float voltage, you can't use it. Most Keysight power supplies can be floated to 240 V above or below earth ground. Some higher voltage models can go higher. You have to look up the specifications. I'm designing a IEC Class I device with requirement of grounding the chassis. How should I connect the ground of the internal circuit? Should it float (connect to V-) or is it OK to connect V- with the chassis and AC ground? Hi. Your question is really about the IEC Class 1 requirements and how they pertain to the internal design of your device rather than about the application of Keysight power supply products, so I am unable to address your question here. I suggest you pose the same question to an expert on the IEC standards. If you have a question about the application of our Keysight power supplies, I will be happy to answer it.